Beechey came from a family of artists. 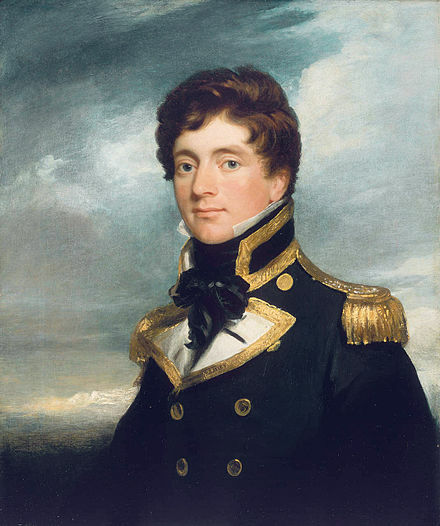 Connected to a high ranking Admiralty Officer, Beechey entered the British Navy at the age of 11 as a midshipman (Officer Cadet). He was at The Battle New Orleans (1815), as it happened, so was John Franklin; he came out of it as a lieutenant. Beechey was the second lieutenant aboard HMS Trent with Franklin when both HMS Trent and HMS Dorothea, in 1818, went on an expedition north to the east of Greenland, above a frozen group of islands know as Spitsbergen. They failed to get any nearer to the Pole than between the 80th and 81st parallels of latitude, at which point their progress was arrested by an impenetrable barrier of ice. Beechey, was with William Parry when he explored, in 1819, to the west as far as Melville Island. Beechey, in the Blossom sailed into the Pacific to make a run at the northern passage from the west; this at the same time when Franklin was making his Second Arctic Expedition, 1825-27.